With more than 11 million square feet of LEED-certified projects built over the last 14 years—including Portland’s Brewery Blocks, The Portland Armory, and the Lloyd EcoDistrict—the visionary firm takes sustainable design to a new scale. With the recent LEED® Gold certification of The Osprey Apartments in Portland’s South Waterfront, GBD reached a significant milestone: our 50th LEED-certified project. 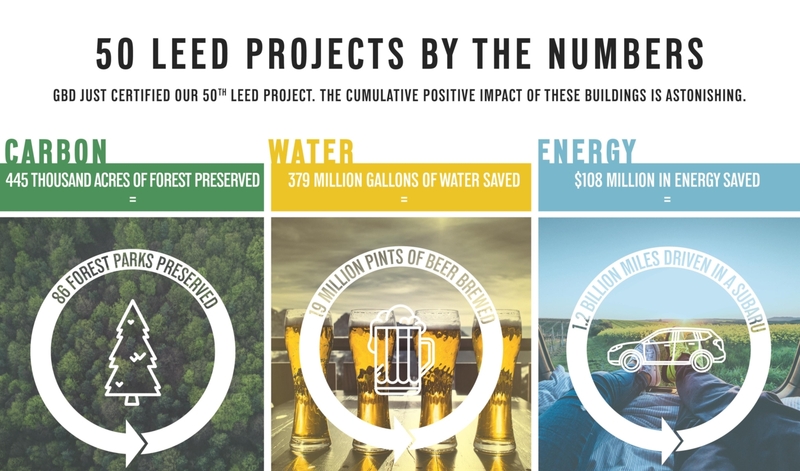 As one of the nation’s early adopters of LEED, or Leadership in Energy and Environmental Design, we hope to demonstrate that sustainability, beauty and high-quality design go hand-in-hand. These 50 LEED projects have helped shape Portland’s built landscape and reputation as a center for sustainable design. GBD’s LEED-certified portfolio of projects, designed and built over the last 14 years, includes more than 11 million square feet of office, residential, retail, medical, educational, performing arts and multi-use buildings in Portland, Los Angeles, Seattle and other cities throughout the West. These projects have significantly reduced carbon emissions, water and energy use, increased density in urban centers, led to advanced building codes that allow for measures such as on-site treatment of gray and black water from residential uses, and revitalized neighborhoods by building a strong sense of community and environmental awareness. Celebrating our 50th anniversary in 2019, we want to lead clients into the next frontier of green building—from Passive Houses to Living Buildings to Eco Districts.